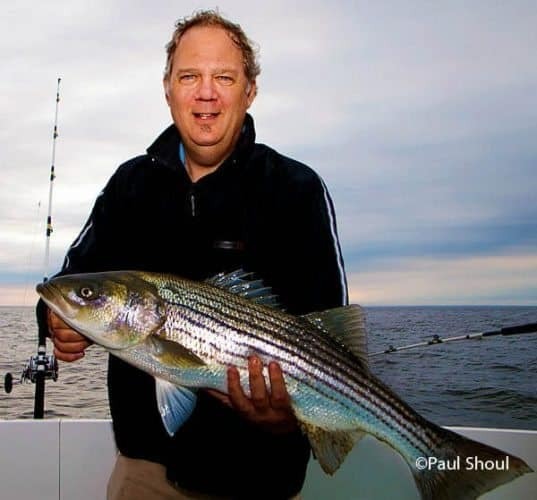 Striped bass is the prize for every angler fishing in Rhode Island. Paul Shoul photo. In the part of Rhode Island far south of Newport and Providence, an accent predominates. You hear people cheering for the Celtics and the Red Sox in the bars in a distinct Southern Mass/RI accent. 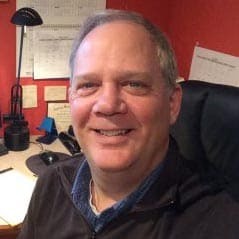 Think Matt Damon and Ben Affleck in Good Will Hunting, or those lovable Tappet Brothers on NPR’s Car Talk.That’s what I’m hearing, about bahbah shops and cahs. Love it. Revolutionary War re-enactors get ready for a parade in East Greenwich, RI. photos by Max Hartshorne. Rhode Island is the tiniest state in the US (at just 1,214 square miles, smaller even than Delaware!). Within its diminutive borders, with giant Narragansett Bay in the middle, surrounded by Massachusetts, Connecticut and lots of ocean to the south. The only big city, Providence is up in the north. But my destination was far south, all the way down the artery that bisects this small state, Route 4. This road intermingles with the old US 1 north to south. Rhode Island is easy to get to, with Southwest Airlines flying to TF Green Airport from many cities. 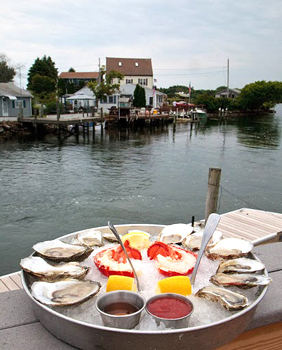 East Greenwich, Rhode Island, has the distinction of being the wealthiest town in the state. It has a narrow main drag with 200-year-old houses lining it along with the shops and restaurants. There I got a chance to watch a New England town come together for the monthly Main Street Stroll. Once a month between May and September, the town comes out and strolls the sidewalks of Main street, enjoying free nibbles (like big meatballs from Sienna restaurant) and ice cream. The bars are bustling, the Sox are on the tube, and there is a festive feeling in the air. The food and sense of togetherness is fun, but what makes the stroll important is how many locals and visitors it brings out. Even on a chilly overcast June night, dozens of teenagers, young moms with strollers, and dog-walking thirty-somethings laughed and talked and watched a parade of Revolutionary War re-enactors. 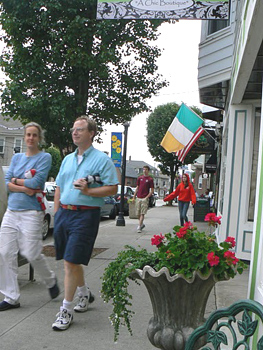 Townsfolk enjoy the Stroll, walking up and down Main St. East Greenwich, RI. 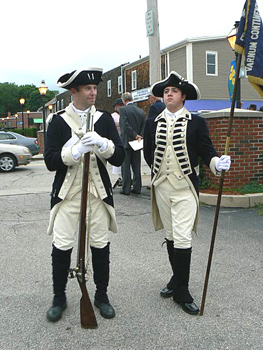 The summer night’s stroll theme was Navy Day, commemorating the first time a navy was organized right here in Rhode Island before the United States even existed! There are foods in this tiny state that you can’t find anywhere else. One is Party Pizza. This Rhode Island specialty is cut pizza pieces, made without cheese, just sauce, served cold. Surprisingly tasty! Other Rhode Islanders told us about Dels Lemonade, an icy drink like a slushy that is available at a Cranston shop and in supermarkets around the state. 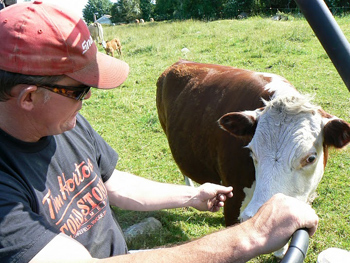 Sunset Farm, a preserved 180-acre farm just outside Point Judith, is a popular place for locals and tourists to buy local meat and produce. Rhode Island clam chowder is another specialty, which the locals originally called “Manhattan clam chowder” to denigrate those who deigned to choose the tomato-based version over the traditional recipe made with milk. Spinach pies, hot wieners, (small hot dogs served with a meat sauce with chopped onions), and snail salad round out a short list of what many Rhode Islanders love to eat. 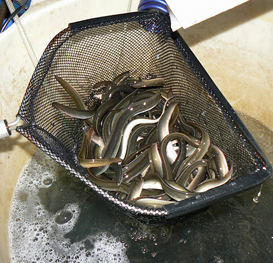 Eels are a favorite, if expensive, bait used to catch stripers. Later I found out that dogfish, an undesirable yet plentiful fish in these waters, love eating the eels, meant to attract stripers, and at $1.50 apiece it gets pretty expensive. When Perry Raso was in high school, he discovered a way to always have walking around money. It came from below the wet sand near his home in South Kingstown. Digging clams was the way he kept his car running and his wallet full back then. Perry Raso, oyster farmer. photo by Paul Shoul. The location right on the water in Matunuck where the Potter Pond estuary drains, provides diners with gorgeous views of boats coming in and out, and of the dock where he keeps the little outboard that he uses to harvest the oysters.Today Raso is still digging in the mud and mining the sea. 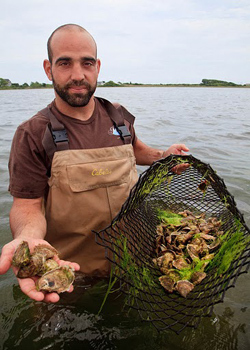 His Matunuck Oyster Bar and thriving oyster farm keeps him and six farm employees busy six days a week. We joined Perry on his small motorboat and watched as he waded in the water to show us the heavy plastic mesh bags that contain varying sizes of the bivalves. “We have millions and millions growing, they grow in these bags that are all set up in rows. It takes about two to three years for them to grow to maturity,” he said. Later in the restaurant we sampled his tiny Matunuck oysters, and the little larger variety, the Ninigret. Whether served raw and briny, or prepared with cream and spinach in Oysters Rockefeller, they were fresh, salty and delicious. Matunuck oysters. Photo by Paul Shoul. While Perry is doing well with this bustling restaurant and a wholesale business to New York, Boston and Atlanta to beat the band, what stirs him more is the work he’s done in developing countries. The fishing hamlet of Galilee, in the town of Point Judith, on the tip of Southern Rhode Island. 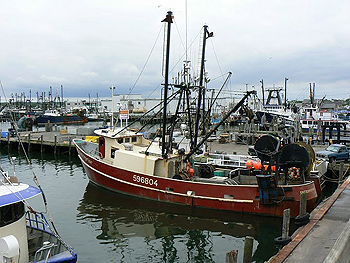 It's home to a large fishing fleet. The fishing hamlet of Galilee, located in Point Judith, a cape facing Block Island, has a single road and lots of fishing boats and ferries docked there. It’s right across the harbor from Jerusalem, Rhode Island. Point Judith is the departure point for two ferries that service the small island, just about 13 miles off the coast, between Long Island NY and the tip of Rhode Island. Just over 1000 people live there year round, and the population can triple on July and August weekends. There is a good reason so many boats make this ten-plus mile journey, it’s called cross rip. There is a section of ocean with a cross-current, a little ripple, which implies a great depth. Microscopic plankton bubble out of there, and stripers and blues like to feed there. Our four-headed hooks baited with simulated plastic eels would soon find their quarry.We would head out to the waters just off this small island to find the striped bass we were seeking, with Captain Charlie Donilon. As we sat in the flying bridge aboard his 46-foot fishing boat, the Snappa, Donilan told me about the olden days. 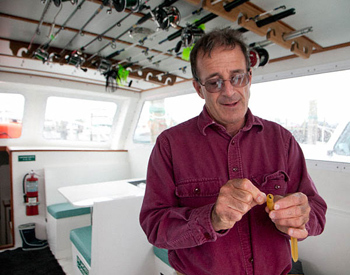 He began fishing here in Narragansett Bay in 1971. We were fishing on a Sunday afternoon, our photographer Paul Shoul and I, joined by a mom and three teenaged boys. 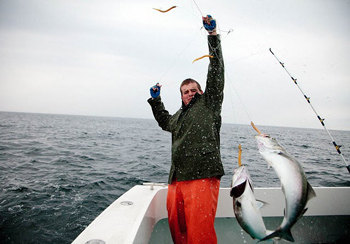 Also aboard was the very competent First Mate Ryan Proulx, throwing in the four-hooked lines and crying “FISH ON! !” when the rods would be begin to bow down, loaded with fish. Ryan had the youthful, steely confidence that led me to tell him I think he’s going to have his own boat very soon. Charlie Donilon. photo by Paul Shoul. 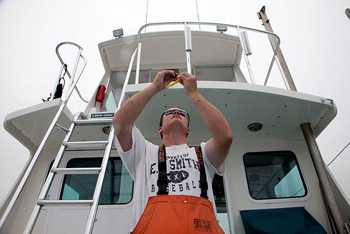 The fact is that these are the prize that all fishermen here are after; unlike the more common bluefish, the stripers are larger, have beautiful green stripes, and have a more complicated and savory taste.Charlie recalls the years when the Bay’s most prized catch, striped bass, were not allowed to be taken. A marine biologist once told me that the comeback of this big, strong game fish is the success story of the century. These bass were so overfished they almost went extinct; today, sport fisherman may take two fish over 28 inches each per day. 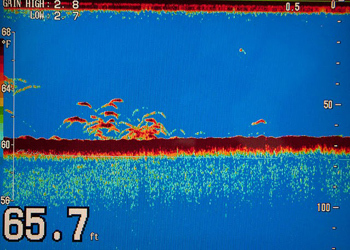 Fish finder shows the striped bass, on the screen. We reeled in six keeper stripers, big fish about 30-33 inches, and we had the kids pose holding the giant beasts across their chests. The young teens struggled to wind the metal line, indeed, pulling in a heavy 32-inch fish takes work! We watched as Ryan filleted the stripers and some of the blues, flipping the skins overboard to be quickly chomped down by the hovering seagulls in the boat’s wake. There are few things as pleasant as watching the sun go down while you’re on a boat looking down at a whole bunch of fish. The stripers turned out to taste delicious following Charlie’s recommended recipe: wrapping them in foil with red, yellow and green peppers, some butter, garlic and bread crumbs. Tossed on the grill for about 20 minutes, we were ready to eat…and gorge we did. Rhode Island is a compact little state with a whole bunch of great reasons to make it a summer travel destination. Whether you’re heading for the bustling city of Providence or the more laid back South County, there’s a whole lot here to make you happy. First Mate Ryan Proulx, steady hand with the hooks. Two blues on the line. Paul Shoul photo.